Each semester runs from middle of October until end of March. 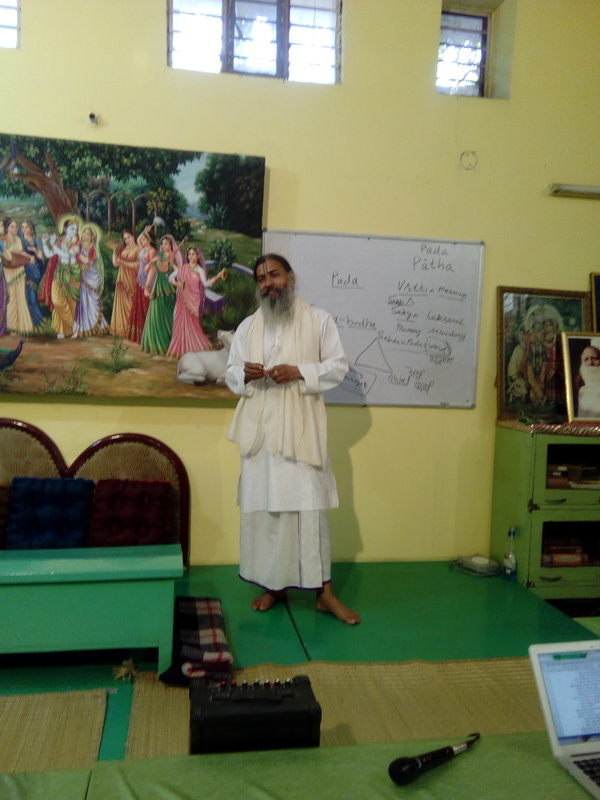 Bhakti-tirtha Level 2 at Jiva Institute Vrindavan has started on October 16th and will be running through March 30th 2018. 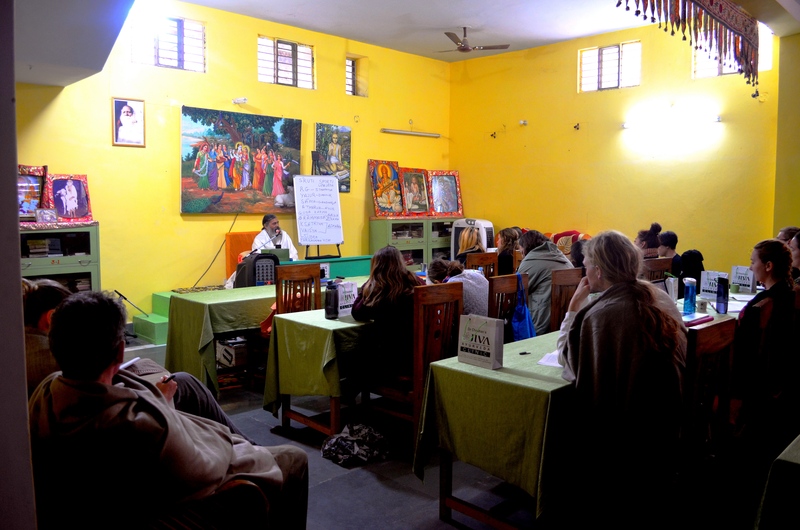 On Sunday 11am there will be special optional classes on Sacred Vedic Rhythm and Mṛdanga, Dramatic Performance and Musical Arrangements of Rasa Lila Performances in Vrindavan, Vedic Psychology, Feminine Spirituality, Theogony of Sound, and other lectures and seminars by visiting teachers. 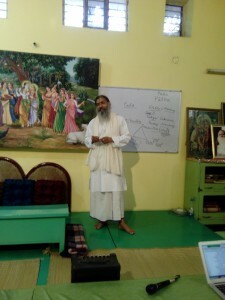 On Saturdays and Sundays at 5pm Babaji will give Bhagavatam classes, unless there is some other special program. Bhakti-rasāmṛta-sindhu by Śrī Rūpa Gosvāmī is one of the essential books of the Gaudiya sampradya that teaches the progressive stages of bhakti and the various rasas. Śrī Jīva Gosvāmī’s Bhagavat Sandarbha is the second book of the Six Sandarbhas that presents a detailed analysis of the Absolute Reality in its hightest manifestation Bhagavān, based upon Śrīmad Bhāgavata Purāṇa. Tarka Saṅgraha is an entry level book offering a systematic overview of Nyaya/Vaisheshika in its newer (navya) period. Kavi Karnapura’s work Alaṅkāra-kaustubha is a book on Sanskrit poetics.Jagadananda prabhu’s Sanskrit course will follow the new publication “Jiva Tirtha Sanskrit: Sādhaka Pāṭhyam and other Sanskrit Primers”. 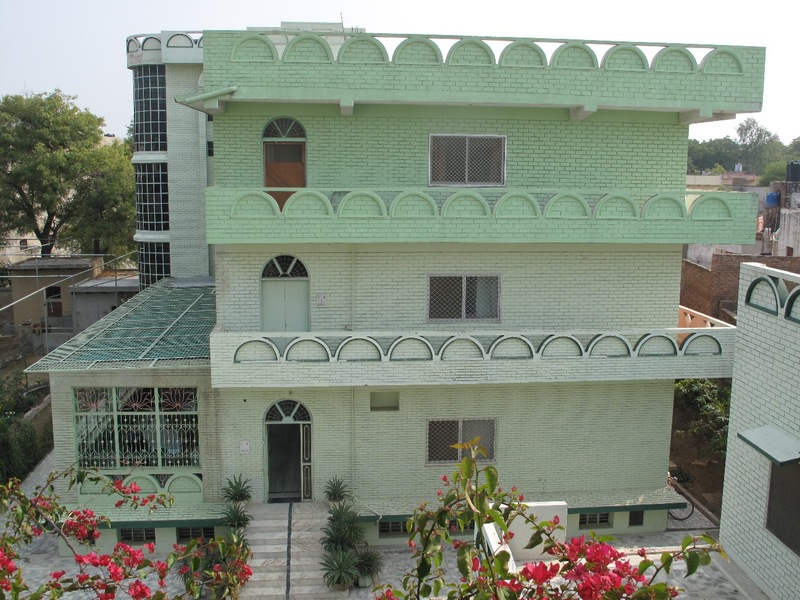 Jiva Institute also offers optional courses on demand, e.g. Yoga, Hindi, classical music, and Ayurvedic cooking. On special occasions we will also conduct tours of Vraja (Radha Kunda, Govardhan, Nandagaun, etc.). End of December there will be a two-week introductory course on Hinduism for students from Rutgers University, New Jersey, which can be attended by the Bhakti-tirtha students. Accommodation:Ashram: $ 150 per month. $ 800 for 6 months in advance.